Skip the Indian take-out and try this simple and easy, creamy slow cooker butter chicken that is made in your crockpot. One of our favourite things to order for takeout is Indian – and yes, even though I love to cook and run a food blog, I also love to order takeout, especially when it comes to foods that you might not make at home on a regular basis. 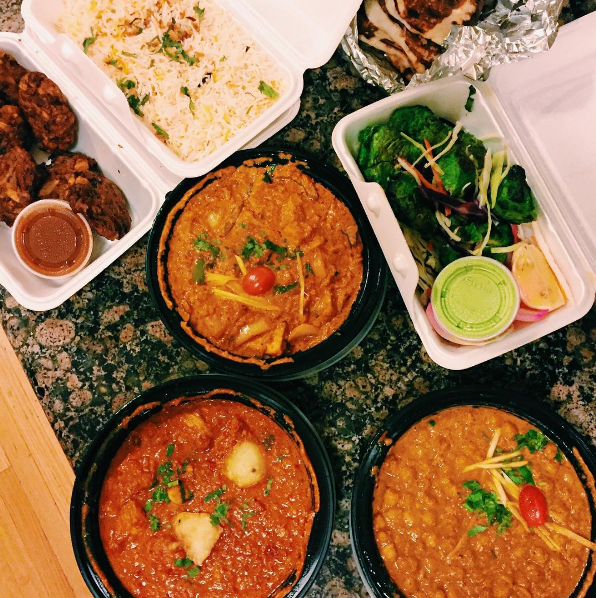 We’re pretty lucky here in Toronto because there are a hundred and one different things you can get for takeout, but Indian is our go-to, especially because we’ve had 17 days in a row of cold weather alerts. Hello – I’m craving comfort food. There are usually three different types of chicken dishes on our order, Chicken Kadai, Chicken Vindaloo and of course, Butter Chicken (you can see these in the snap below). Can you guess which one is my favourite? Of course, Butter Chicken! So my next question was; how can I make butter chicken at home? I opted for the slow cooker for this butter chicken recipe because I knew it would make the chicken incredibly tender and the sauce, because it has a long cooking time, would be extra flavourful. This recipe starts by browning and chicken and onions before adding them to the slow cooker. I find searing the chicken and cooking the onions add extra flavour–you don’t want any raw onion flavour in your butter chicken. I also cook the spices at this time as raw curry powder can have a really bitter taste, so it needs to be cooked out a little bit before being added to the slow cooker. The liquids of this dish are coconut milk, yogurt and tomato paste. The tomato paste is what gives this dish its signature colour and the coconut makes it extra creamy. This dish takes about six hours to cook and then I finish it off with a little bit of sugar (the same way you would in a tomato sauce). I also don’t add any butter to this recipe as I don’t find that it actually needs it. If you want to, you can add a couple of tablespoons of butter, but it isn’t necessary. 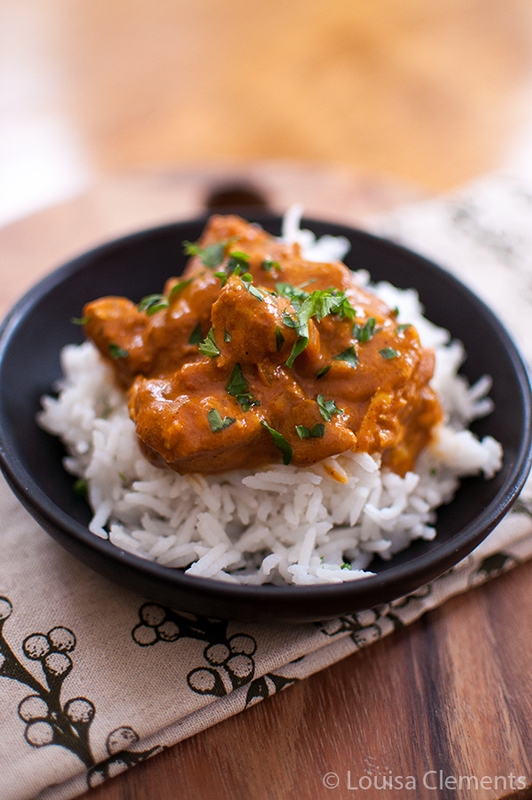 If you’re looking for another Indian slow cooker dish, you can try my Tikka Masala. Enjoy the flavours of India with this creamy slow cooker butter chicken made with coconut milk. Heat olive oil over medium-hight heat. Brown chicken on all sides in batches, about 2 minutes. Once browned, remove chicken to slow cooker. Add onions to pan and cook for 4-6 minutes. Add garlic, garam masala, curry powder, turmeric, ginger and salt. Cook for another minute. Add onion and garlic to slow cooker. In a large bowl, whisk together tomato paste, yogurt, coconut milk and sugar. Pour coconut milk mixture over chicken and onions. Cook for 5-6 hours over low heat. Let me know if you give this recipe for slow cooker butter chicken a try in the comments below. This looks delicious and so easy. Thanks! Thanks, Bridget! Let me know of you give it a try. Indian takeout is the best! Probably because the flavors only get better the longer it sits. I can't wait to try this. I'm all about slow cooker recipes lately. I love knowing that my slow cooker is busy working on dinner while I'm out and about. Exactly - this dish tastes better after a day in the fridge! Let me know if you give it a try, slow cooker recipes are the best for this time of year! Thanks, Consuelo! I've been trying to find a butter chicken recipe also, that's why this was so much fun to develop! Let me know if you give it a try. This looks delicious! Thanks for sharing. Have you tried it with 1% Milk instead of the coconut milk? Hi there,I haven't tried it using 1% milk so I'm not sure how that would work. I will say, the coconut milk adds a really great sweetness and depth of flavour to the dish! Is there a suitable substitute for coconut milk for the sake of allergies? Hi Virginia, I've never tried it myself, but you could try using sour cream instead. Let me know how it goes! This looks wonderful. Two quick questions: when you say 5 boneless breasts, do you mean 5 single cutlet portions? Also, canned coconut milk or carton? Would love to try this soon. Thank you, Diane! Yes, 5 single skinless boneless chicken breasts and I've always used canned coconut milk! Hope that helps - let me know if you give it a try! Made this last night and really enjoyed it! Have a lot leftover since it's just the two of us, but looking forward to leftovers! Thanks for sharing, Diane! I'm so glad that you liked it - I think the leftovers are the best part. This recipe looks really good but I have a terrible fear of Indian food because of the heat. How spicy is the chicken? Also, what kind of yogurt should I use and where can I get these Indian spices? Sorry for the dumb ? about the yogurt but I've never delved into this ethnicity before! Hi Kim, not dumb questions at all! This chicken is actually quite mild, so I wouldn't be too worried about the level of heat. In terms of the yogurt, I use plain yogurt for this recipe, not greek yogurt. I have found these spices in the spice aisle at my local chain grocery store - I believe they are quite mainstream these days, so hopefully you'll be able to find them too! Love this recipe! Made it twice now and is gorgeous every time. Im going to try using lamb/beef next to see how that turns out. Hi Ria, thank you! I'm so glad that you like it - love the idea of using lamb or beef! Let me know how it turns out. Nice recipe. Wondering why there is no butter in butter chicken. Hi Sundar, I decided not to put any butter in this recipe to keep it lighter. Typically butter chicken can have a couple of tablespoons of butter in it. Hope that helps! I made this the other day and have been bringing leftovers to work. Two of my coworkers asked for the recipe and were surprised that it was easy to make. Definitely have been enjoying it this week. Thanks! This was tasty and easy to make however, mine was done after 3 hours on low. It doesn't quite taste like other butter chicken recipes I've tried, but it was still good. Thanks! Hi MC, I'm glad you still enjoyed it - thanks for sharing! I am making this dish right now!! I have been searching for a recipe called Madras chicken that I had in St. Martin....your recipe sounds close. I hope it comes close--it smells great! Hi Sheila,I hope that this was close to the Madras chicken! It's one of my favourites. I made this recipe the other day, and brought in some leftovers for a coworker, who then asked for the recipe. Even my super picky husband loved it!For the poster above: I used greek yogurt and it was great!Thank you for bringing a new staple into my meal planning! I'm so glad you and your husband enjoyed this Shauna! This looks amazing! 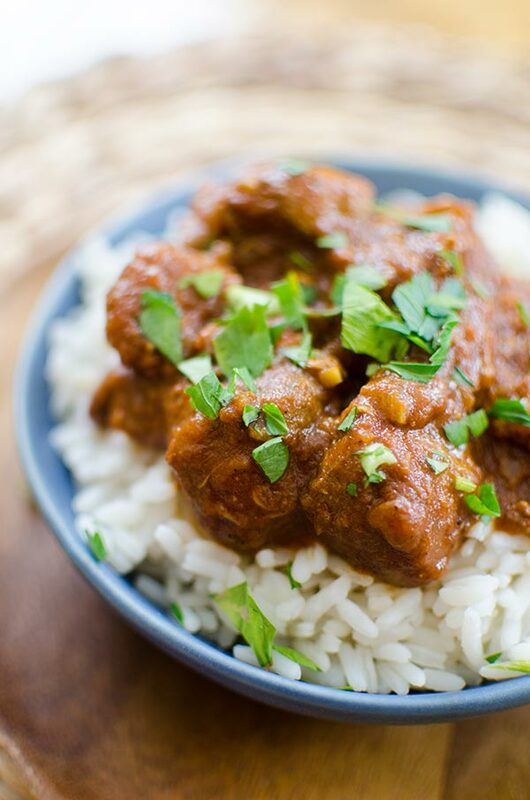 My husband loves Indian food so we might have to try this out since...we are terribly lazy and slow cooker meals are great for us :D.
Thank you, Gwenayfer! Let me know if you give it a try, it's one of my favourites. Made this the other day and while the initial flavor was spot on, it quickly turned into a bitter aftertaste. Any ideas why this May have happened or what can be done to salvage the dish? Hi Diana, I'm so sorry that this turned out bitter for you! I've never had that problem so I'm not quite sure what happened, did you check the expiration date on your yogurt, coconut milk as well as your spices? That might have something to do with it. In terms of balancing out the flavours I would try adding a touch more sugar to balance out the bitterness. Let me know how it goes. I wonder if this would work with chunks of lamb instead of chicken? Hi CJ,That's a great question. I've never tried this recipe with chunks of lamb, but I've made other dishes in the slow cooker using lamb and it worked just fine. Let me know how it goes. It worked! I used two lamb chops and cut them up, than also added quartered Roma tomatoes and chopped up some red and yellow bell peppers to add more substance, since I didn't use as much meat. Hi CJ, thanks for letting me know! I love the changes you made to the recipe, I definitely need to try this with lamb next time. I'm glad you enjoyed the recipe! Hi Joyce, you can definitely use chicken thighs and fresh ginger - I would use 1 tbsp of grated fresh ginger for the 1/2 tsp of ground here. Let me know how it goes! I tried this recipe last night and it smells and tastes great. I just has an issue with the consistency. My curry turned out really thick and not saucy enough. Do you have any suggestions on how I could thin the curry sauce? I was thinking simmering it with coconut milk and a bit of hot water. What do you think? Hi Jenna, hmm not sure why it would have come out really thick. I think your idea to simmering it with coconut milk and a touch of water is a great idea. Let me know how it goes! Hey Lou!What size slow cooker are you using, and can you freeze the leftovers? Hi Tracie,I've made this recipe in a 4 quart and a 6 quart slow cooker and they have both worked well! I've never tried freezing the leftovers myself, so I can't guarantee what it will be like, that said, I can't foresee any problems. Let me know how it goes! So glad you loved it, Claudette! The leftovers are the best part! Hi, Love the look of this. Can I ask what you mean by tomato paste though plz. Do you mean purée or passata ? Hi Kostar, thank you! 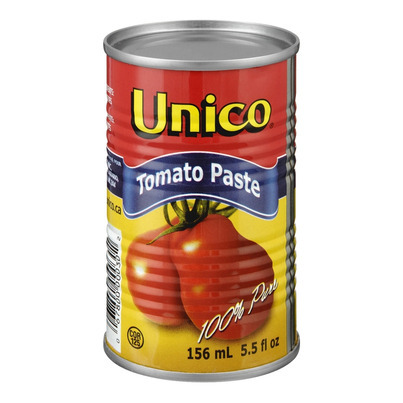 When I say tomato paste, I mean the thick, concentrated paste. It usually comes in a tube or in a can, here's a photo of what I mean. Let me know how it goes. This recipe was easy to follow and put together. My first time cooking Indian. .but I feel there is too garam Masala. . It was very fragrant with cinnamon and nutmeg notes (which is what the spice reminded me of ) I had to add more coconut milk and curry powder to dim it down. Am I missing something? Was it supposed to be 2 tsp vs tbsp? We eat butter chicken alot and never has it tasted like this. It's still good and we enjoy it but it's not what I expected! 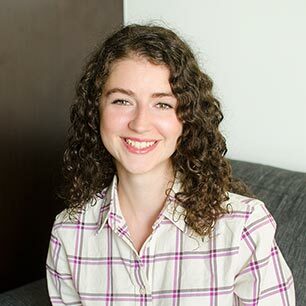 Hi Amanda, thank you for your comment! The amounts are correct and it doesn't sound like you're missing anything. The spices may have been a bit too strong for your palate, but the adjustments you made sound great. Thanks for letting me know and I'm glad you were still able to enjoy it. Hi Kirstin, I hope you like it! I prefer to heat things like stew and soup up on the stovetop in a pot over medium-low heat stirring every now and then. Be careful about using high heat as the bottom might scorch and burn, medium-low is definitely the way to go. I made this once and loved it. I plan to make it for company this weekend. What would you serve with it? Rice, I assume, but what vegetables? And would you serve Indian break or is that too much with the rice? I love basmati rice. Thanks - can't wait to see how my guests like it. Hi Jan, I'm so glad that you loved it, I hope your guests do too! I would serve this over basmati rice and I think serving with naan would be delicious. Instead of a typical vegetable side, I would actually serve this with a nice big salad, maybe a spinach salad? Hi Marianne, it should be fine in the freezer. One thing to keep in mind, coconut milk tends to get a little grainy in the freezer, but I think the other ingredients in the sauce will help stabilize the coconut milk. Let me know how it goes! Funny I should see this post as I was planning on making some butter chicken for my Friday night dinner. My recipe doesn't vary too much from yours; I use ghee for cooking the chicken and diced or crushed tomatoes instead of tomato paste. However, I usually cook it over the stove - I think I will try your slow cooker method this time. And I always cook my onions and spices before putting in the slow cooker to get the most flavor from them. Just made this today, and it is delish! I can't have sugar so I used 1 teaspoon Swerve sweetener instead. My husband isn't big on Indian food but even he loves this. Adding this one to the regular rotation! Thanks for sharing! Hi Sierra, I'm so glad that you and your husband loved this recipe. Thanks for letting me know! Making this as we speak... I poured the sauce over everything... should I stir it ? Or just leave it be on top?? I really like this recipe, but could I make this in the instant pot on high and for how long? Hi Brigitte, I've never used an Instant Pot so I'm not sure how long it would take, I'm sorry!